The Staco Firstline P series is a three phase double conversion Uninterpretable Power System, sized from 65kVA to 500kVA. The Firstline PLT series UPS can be paralleled up to eight modules. The entire FirstLine P is suitable for a wide range of applications thanks to the flexibility of configurations, accessories, options, and choice of performance levels. 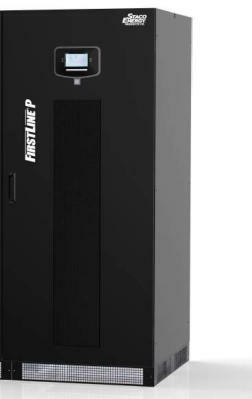 From small to mid level data centers, the Firstline P is a great choice. Size Range: Models - 65kVA, 80kVA, 100kVA, 125kVA, 160kVA, 200kVA, 300kVA, 400kVA, & 500kVA Applications • Data Centers • Computer Networks • Industrial Process Manufacturing • Hospitals/Medical (OSHPD Certified) • Education/Research • Laboratories, Bio-Tech • Pharmaceuticals/Chemical • Critical Power Management Requirements Benefits: • Front Access only • Dual feed configuration, rectifier input and bypass input. • On Line Double conversion design • Output Power Factor 0.9PF • 2 year Warranty on electronics.